I like to think Shakespeare would’ve been a fan of fridge-magnet poetry, composing his iambs and inventing new words to suit him. But Shakespeare wasn’t married to my husband. On Sunday, I was playing on my phone with a fridge magnet poetry app. I came up with this dark, angst-ridden, middle-age-y poem. I then strutted my portable-fridge app over to my husband. He took one look at it and burst out laughing. And just like that, we added a new term to our family vernacular. Any fridge-magnet poets out there? 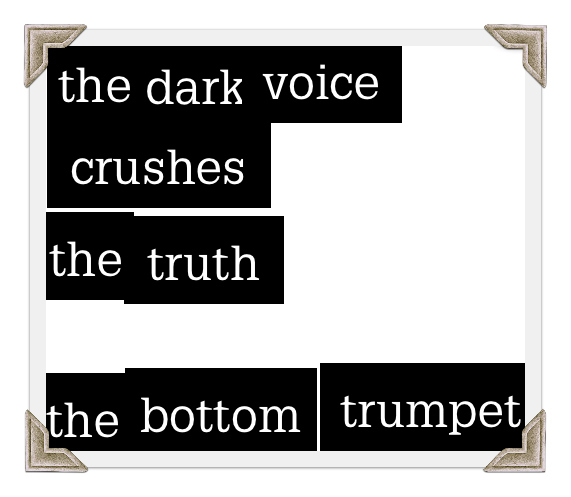 What song or poem do you think would be improved with the addition of the phrase “bottom trumpet”? For Whom the Bottom Trumpets? Hahaha love it! Escaping Elegance is the E.E. in Cummings. Ironic Mom you win for “bottom trumpet.” Love! What does the bottom trumpet say? Do I do the same for you? Whatever the bottom trumpet says – you’d better listen and heed well. A bottom trumpet, a bottom trumpet, my kingdom for a bottom trumpet!! I’m reading Gone With the Wind right now and sense a strong potential tie-in, but I’ve got 500 pages to go. A tale told by an idiot, full of bottom trumpets, signifying nothing. If music be the food of love, play on with your buttom trumpet.